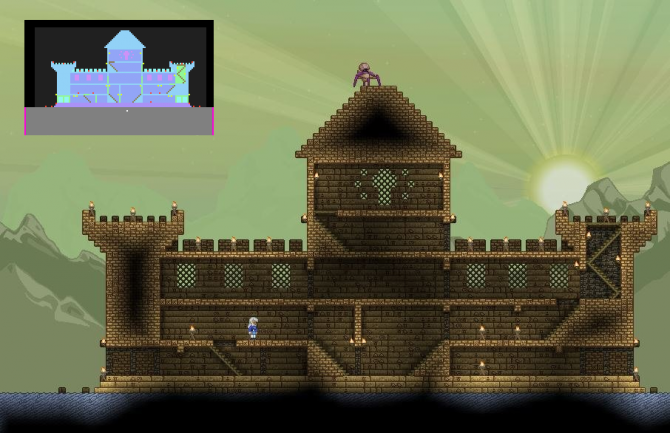 Some dungeons, such as a Hylotl Underwater City, have a shield generator inside them that protects all blocks and furniture within dungeon boundaries from being mined. Disabling this shield will allow players to pickup locked objects and blocks. Village dungeons are usually a collection of many buildings on the surface of a planet. They have many NPCs of all kinds in them, from simple villagers and merchants to guards and kings. NPCs in villages are not automatically hostile to the player. If the player steals 3 items in view of NPCs (one NPC catches you stealing 3 or more furniture items) they will become hostile or call guards to attack you. This will not happen with blocks, however, making it safe to dig to a secret chest without aggroing the village. NOTE: Breakable vases and flower bushes can count towards accusations from villages as well. There is also a bug that causes furniture that you place to be included towards the threshold. Most dungeons have a higher chance to appear on planets of a particular primary biome. For instance, all four Floran dungeons are more likely to be found on forest planets than any other planet type. Note that this does not mean that this is the only planet type that a dungeon can generate on. There are some planet types which do have restrictions on dungeon spawning. Moons, Asteroid Fields, and Barren planets will not generate any dungeons. The ocean-like Toxic, Arctic, and Magma planets also do not generate dungeons. Ocean and Garden planets can contain dungeons, but are limited to certain ones. Currently, they are also the only place where their respective dungeons can be found. There can be many microdungeons on the surface and underground. Microdungeons are small buildings or landforms, usually only comprising of one or two rooms. With the 1.3.0 Update, three types of space dungeons were added to the game: Space Encounters, NPC Ships, and NPC Space Stations. These can be encountered while inspecting star systems in the Navigation Console. All space dungeons required a mech for exploration. Dungeons are a great place to get rare and valuable treasures. Dungeons often have a unique pool of items along with a common pool, depending on the type of container. Basic Treasure often appears in non-chest containers such as boxes and crates, while Valuable Treasure usually appears in dungeon-themed chests. Most dungeons (including villages) also have a single special chest which contains one Large Dungeon Reward. Dungeons are procedurally generated by assembling pre-built rooms and attaching them to produce a unique design. 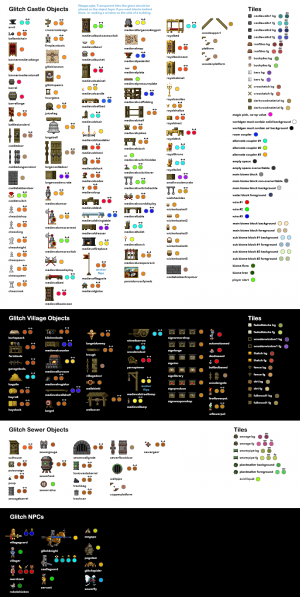 The game uses color 'maps' like the one below to determine how the elements are built, then the game engine checks that map against a dungeon key and places all of the rooms, objects, monster spawns, and loot chests. In early 2015 Chucklefish transitioned to using the map editing program Tiled for dungeon generation instead of PNG maps. This page was last modified on 26 October 2017, at 15:15.